“Thank you very much. What an honor it is to be with all of you. Thank you for being here. Thank you for speaking out again and again. I know that the day started with John Avalos, Supervisor Avalos, kicking off this rally. And I’m happy to be with here with Kaydor, Representative of His Holiness the Dalai Lama in the Americas; with Kelsang – I’m using only first names – the President of the Tibetan Association of Northern California; Giovanni Vassallo, President of the Bay Area Friends of Tibet; Tenzin, President of San Francisco Tibetan Youth Congress; Sonamtso Lama, regional coordinator of Students for Free Tibet. And I want to acknowledge each and every one of you. How special you are to be here. “It is my privilege to join you in standing united for Tibet. It’s an honor to be joined by so many of San Francisco’s proud Asian-American community, Pacific Islander community, who have been steadfast advocates for justice and human rights, for peace here in the United States and throughout the world. 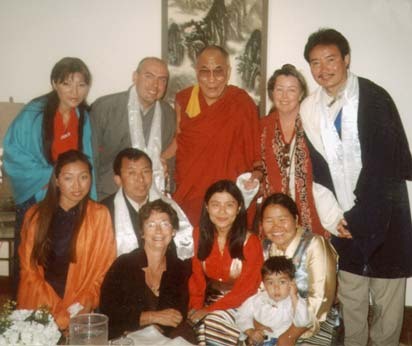 “As you know better than anyone – some of you weren’t even born yet, some were, I was – for the past 56 years, people around the world have commemorated the Tibetan National Uprising, by marching, advocating, and rallying on behalf of the people of Tibet. Today, we honor our friendship and solidarity with the people of Tibet by redoubling our efforts on their behalf. We will continue standing up and speaking out until Tibetans can enjoy religious, political, and cultural freedom. “I’ve said it here many times; I’ve said it on the floor of Congress; I’ve said it when I’ve visited His Holiness in India: the situation in Tibet is a challenge to the conscience of the world. Until every child is able to learn about his or her heritage and culture in their own language, we will stand united. Until every person is able to practice his or her faith without fear of persecution, we will stand united. Until possessing a photograph of His Holiness the Dalai Lama is no longer used as an excuse to imprison the faithful, we will stand united. Until His Holiness is allowed to return to his homeland, we will stand united. “This year marks the 80th birthday and reincarnation of His Holiness the Dalai Lama, who describes himself, as you know, as a ‘simple monk, no more no less.’ Our cause is also simple: securing the human rights and the human dignity of the people of Tibet. Together we can help bridge the distance between the inconceivable – to us, it is inconceivable that this will not happen; to us, it is inevitable that this will happen; to the Chinese it is inconceivable it will happen – we have to bridge the distance between the inconceivable to them and the inevitable to us. “A few days ago, I had the privilege of joining a pilgrimage to Selma, Alabama to honor the Foot Soldiers who marched from Selma to Montgomery. I’m going to tell you this story, because when I was there, when I had a chance to speak at a big dinner that they had, I talked about His Holiness. Because we were talking about what happened in Selma. What happened in Selma was about nonviolence. What happened in Selma, and the whole Civil Rights Movement in America, was about nonviolence. It was nonviolence that was learned from the leadership of Mahatma Gandhi in India, where His Holiness now lives. That nonviolence of Mahatma Gandhi, used by Martin Luther King, Jr. in the Civil Rights Movement, used by Nelson Mandela – about reconciliation, not revenge, civil discourse. That’s what Lincoln was about in his Second Inaugural Address. He reached out a hand of friendship to the South, to bring them in, to end violence and have respectful civil discourse. “So while we were talking about that, I told them this story about His Holiness, and his commitment to nonviolence. 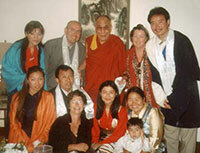 When I visited him there, I brought a very distinguished delegation of Members of Congress to see him in Dharamsala. And he brought in a large number of Lamas from all over the region. Before we met with the Lamas though, in the morning, we saw people who had just come over the mountain. And they were crying at the feet of His Holiness. They were telling us about what they saw in Tibet, and how the Chinese were treating the people of Tibet and people in prison, and people that they were imprisoning – about the self-immolations that were taking place there. This was March of 2008, so you know what that year was in Tibet.